The beautiful and distinctive Lacy Phacelia, with protruding stamens and curled fuzzy flowerheads. Lacy Phacelia is happy to grow on steep slopes. The lower elevations fringing the San Joaquin Valley are the first to bloom. Ryan Richardson took this photo of a Phacelia colony outside Arvin late in the afternoon last week. Lacy Phacelia is a plant of many virtues, and is beginning to be used in agriculture as a cover crop and insectary plant. Spring is walking her way upslope into the Tehachapi Mountains, turning hillsides green with new grass. Against this verdant matrix she is also scattering patches of colorful wildflowers, from a palette that leans toward purple, yellow and orange. One wildflower in the cool purple/blue part of the color spectrum is Lacy Phacelia (Phacelia tanacetifolia). These exuberant wildflowers typically have pale purple or lilac-colored blossoms with protruding stamens. They are robust annuals that seem quite comfortable growing on even the steepest slopes. Lacy Phacelia is known by several names, including Fiddleneck Phacelia, because the flowerheads curl like the headstock of a fiddle. In this way they resemble the similar-looking but unrelated orange Fiddleneck wildflowers. They have also been called Caterpillar Phacelia, since the somewhat fuzzy, curling flowerheads are suggestive of caterpillars. Yet another name is Tansy-leafed Phacelia, because the foliage is dark green and deeply lobed like that of the tansy plant. By whatever common name it is called, Phacelia tanacetifolia is a very likeable plant: it is fast-growing and fairly drought-tolerant, has a pleasant but subtle sweet scent, and makes beautiful and interesting bouquets — it is actually long-lasting in a vase with water. Lacy Phacelia is well-adapted to the geography and growing conditions in Kern County, and it won't get lonely here, for many of its relatives live in Kern as well: the genus Phacelia is the sixth most represented genus in our county, with a total of 24 species and one subspecies at the present. We have lots of Phacelia in Kern County, and there are multiple species found in the Tehachapi Mountains. The Nuwä Indian people used to eat the leaves of several different Phacelia species. Dr. Maurice Zigmond, an ethnobotanist who in the 1930s studied the Nuwä and their traditional uses of native plants, reports that Phacelia leaves and stems were gathered in the late winter or early spring before the blossoms appeared. These leaves and stems were then steam cooked in the same manner as other spring greens like kuuvuus (pronounced koo-voos, known today as Spring Gold) and other plants. Tender plant foliage was picked and then placed in an even layer on a clean flat rock. Smooth hot stones were put on them, and then more leaves and stems placed on the hot rocks. Water was then sprinkled on top to steam cook the plants. More hot stones were added as needed. The Nuwä word for Phacelia is yuhwitübä, pronounced you-wi-TUB-uh. Lacy Phacelia is a plant of abundant virtues which, like many great individuals, had to leave its own country to have them recognized: Phacelia tanacetifolia is widely used in Europe as both a cover crop and bee forage, since its long-lasting blossoms provide high quality nectar and pollen. 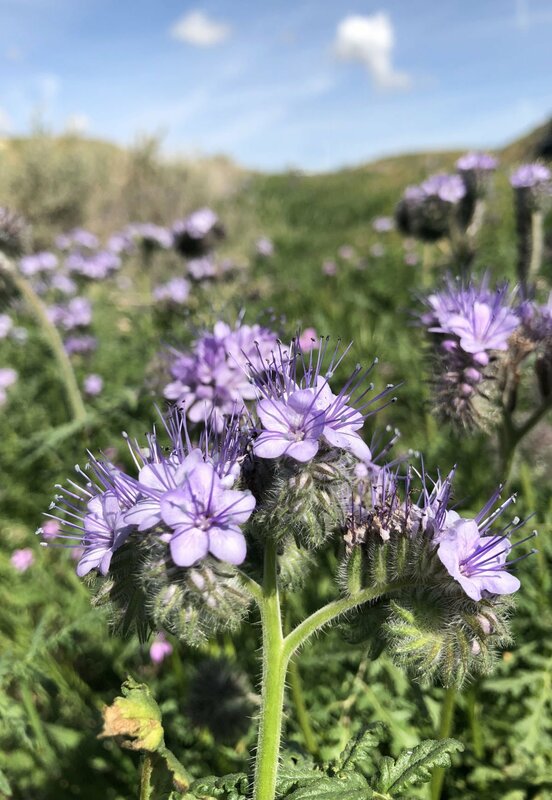 Phacelia is ranked among the top nectar-producing wildflowers for honeybees, and the blossoms also attract other pollinators like wild bees, bumblebees and syrphid flies ("hover flies"). Growing Phacelia between orchard rows or along fencelines and field edge strips is a good way of attracting pollinators to an area so they can also pollinate whatever cash crop may be growing nearby. California vineyards are starting to plant Lacy Phacelia as a winter cover crop between rows of grapevines for weed suppression and to prevent erosion. Phacelia plants break down quickly when tilled under, so they are well-suited for use as a cover crop. It is always somewhat puzzling to me that more people aren't even aware of Lacy Phacelia, since it is such a dependable bloomer and one of our best annual wildflowers. There are large hillsides and slopes currently abloom with Phacelia down at the lower elevations near the San Joaquin Valley and around Arvin, and the upper elevation colonies will soon start to appear as spring wanders her way higher and higher into the mountains, leaving green grass, wildflowers and beauty in her wake. . . .